Pearl millet (கம்பு) is rich in carbohydrate, protein, dietary fiber, vitamins mainly B complex and minerals especially phosphorus and potassium. Pearl millet flour is light brown in color and is available in most grocery stores. In south Indian cuisine, pearl millet is used to make dosa, adai, rice, porridge and roti/chappati. 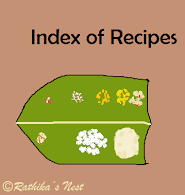 How to make the batter: Wash and soak urad dhal in sufficient water for at least four hours. Later, drain and grind the dhal with required water into a fine paste using the mixer-grinder. Mix pearl millet flour with 2 tumblers (400ml) of water into a paste. Now add urad dhal batter and salt to this paste. Mix very well. Add more water if needed to make the batter into pouring consistency (similar to regular dosa batter). How to make dosas: Heat the tava on medium flame. Once hot, pour a big hollow ladleful of batter on the tava and spread evenly. Pour oil around the dosa. When the edge of the dosa turns golden brown, remove the dosa using a flat spoon and turn it over. Cook for a minute and then remove from the tava. Serve hot with coconut chutney. Note: You may use finger millet/ ragi flour (கேப்பை மாவு) or corn flour (சோள மாவு) instead of pearl millet flour and make ragi dosa (கேப்பை மாவு தோசை) or corn flour dosa (சோள மாவு தோசை) in the same manner.